When Inabata Katsutaro, the Japanese businessman who introduced cinema to Japan with the Lumière Cinématographe on 15 February 1897 swiftly grew disenchanted with the work, he turned to Yokota Einosuke, the owner of a Kobe export-import business. The very opposite of the meticulous and restrained Inabata, Yokota was a flamboyant showman; in Peter B. High's phrase, 'part swashbuckler and part autocrat'. Having gained business experience in the United States, where he had done everything from washing dishes to selling door-to-door, Yokota returned to Japan with an X-ray machine with which he toured, putting on shows in a hut he called 'The Hall of Mysteries'. On acquiring his Cinématographe from Inabata, Yokota journeyed to Tokyo, where Arai Saburo was already exhibiting the Edison Vitascope. The two became great rivals during 1897, Yokota opening two days after Arai on 8 March 1897 at the Kawakami theatre. Yokota made sure to stress the European credentials of his machine, as opposed to his American rival, and would come on stage sporting a black bow-tie and silver-topped cane. Unlike Arai, who saw film as an upper-class novelty, Yokota chose to take films to the people, touring provincial Japan with a large tent he called 'Cinematographe Hall'. This laid the foundations of what was to be one of the major careers in early Japanese film. Expanding widely into film exhibition, by 1915 he was controlling 177 out of Japan's 339 cinemas. In 1907 he moved into production, approaching Makino Shozo to make films for him, initially haphazardly but by 1910 with considerable success following the discovery of actor Onoue Matsunosuke and the establishment of the ninja tradition of action film. His firm was one of the four Japanese majors (the others were Kawaura Ken'ichi's Yoshizawa Company, the Fukuhodo theatre chain and the cheekily named M. Pathé, which had no connection with the French firm) which formed a self-protecting trust in 1909, becoming the Nikkatsu company (abbreviated from Nippon Katsudo Shashin) in 1912. 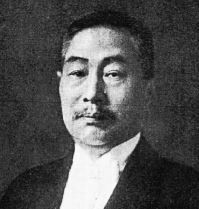 Yokota became the director and eventually the president of the trust for many years, until being forced to resign in 1933.